We love Santa and his elves as much as anyone, but we also know there is more to Christmas than presents and Christmas trees. Christmas is a time to teach children why Christmas is called the season of giving, even among people who don’t practice Christianity. 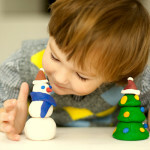 Here are a few ideas to try in your family to teach young kids about the real spirit of Christmas. Volunteer time or items to a local charity. Most kids don’t realize that there are kids in their own city who are less fortunate than they are until someone points it out to them. Take some time to talk about what it means to give, and look for ways you can help within your community. Most churches and schools can set your family up as a Secret-Santa family to help another family in your community. Also, many retailers have giving trees, in which shoppers can choose one or many items to purchase to donate to someone in need. Older kids may even consider volunteering at a food bank. Let them help you schedule your time. The Christmas season should be focused on spending time with people you love, so let your kids help you schedule your family time. Talk about the traditions they love, and make sure to fit those in—even if it means taking other things off the agenda. Take some time to send Christmas cards to distant family members, or even better, to place a phone call to relatives you haven’t seen in awhile. 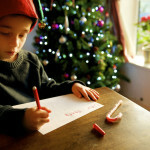 There’s a good chance that your kids have some ideas for new traditions that you haven’t thought of yet. Between movies and friends, they have had a chance to see families engaging in different ways from what you might be used to around the holidays. You may be surprised by the creative ideas your kids come up with. 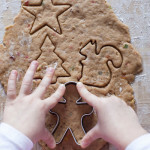 If the kids don’t have any ideas for new traditions, be ready to suggest some yourself, like baking cookies for a local neighbor, or caroling through the neighborhood. Be open to new ideas for family traditions, especially if they get your kids excited about spending time with loved ones or doing something in the spirit of giving. The spirit of Christmas is contagious, so take some time this year to help your kids understand what they can do to help those in need. Spend time reconnecting as a family, whether it’s within your household or by reaching out to relatives you haven’t seen in awhile. Your kids will learn from your example and will grow up understanding Christmas as a season of giving and sharing—and not just receiving.